. 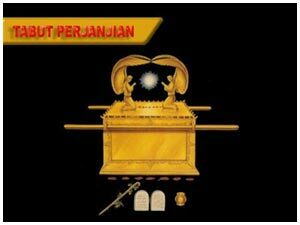 :: Tabernacle Pentecostal Church Kristus Kasih - Malang - Information tabernacle equipment: the ark of covenant ::. This is the most important object in the Tabernacle. On the Ark God revealed Himself and spoke to His children (Exodus 25: 22; Numbers 7: 89). An Ark (chest), this refers to the Church of the Bride. The Mercy Seat with the 2 cherubs refers to the Godhead in the Lord Jesus Christ as the Heavenly Bridegroom. Fellowship in marriage between Christ as the Heavenly Bridegroom and the Church as the Bride, in love. This refers to the holy union between the Bridegroom (Christ), which comes from the Bride. Made of shittim/acasia wood overlaid with gold. These staves were to remain in the rings; they were not to be removed/taken out. The love of God is a sustaining power and everlasting strength for the Church of God (the Bride). The Mercy Seat refers to Jesus, the Son of God. First Cherub refers to God the Father. Second Cherub refers to God the Holy Spirit. Made of shittim wood (flesh) overlaid inside and outside with gold (Holy Spirit, glory, holiness of the Holy Spirit). This is the Church that has attained perfection and glory, of the same level with the Bride, inwardly as well as outwardly (Revelation 21:9-11). Refer to the suffering of the Bridegroom for His Bride. Refer to the suffering the Church bears to attain her perfection as the Bride of Christ. Refers to His presence, experienced by those who have been reconciled with God.